Creativity is the ability to produce ideas, objects or problem solutions that are novel, appropriate and useful. It refers to originality and uniqueness of ideas that did not previously exist. Creativity can be characterized by ‘’effective surprise’’. Here is the collection of interesting psychological facts about creativity. There are no rules to creativity. Young people are more creative than old people. Most creative peoples have a short attention span, are easily distracted and tend to talk to themselves more often. People with high creativity are more likely to suffer from depression, anxiety, or bipolar disorder because they are more likely to feel alone with their ideas. People who prefer to stay up late are generally twice as creative as those who go to bed early. There is a connection between dopamine and creativity. Hereditary factor are important in determining the extent to which one can be creative. People with high IQ were not necessarily creative. Creative ideas may not occur immediately when the person is consciously thinking about the problem or task. It occur when an individual seeking relaxation from conscious effort. They may occur or strike when a person is doing something else, for example, going to sleep, waking up, taking a bath, or just walking. Lack of motivation, fear of failure, fear of being different, fear of rejection, poor self concept, negativism etc may hamper creativity. Taking a walk leads to more creativity than just sitting. Creative people tend to expose themselves to new experience, sensation and states of mind. Openness to experience is the strongest predictor of creativity. There is a deep and meaningful connection between risk taking and creativity. Creative expression is self expression. 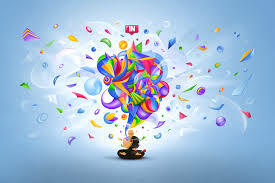 Creativity is nothing more than an individual expression his needs, desires and uniqueness. Creativity is simply the ability to connect dots that other might never think to connect. Diversity of experience more than anything else is critical to creativity. And habit is the killer of diversity of experience. Preparation stage; it require one to understand the task or problem. It include analyses the problem and become aware of the background facts and other useful information. The person looks at the task from different angles and viewpoints. Incubation; in this stage there may be a feeling of getting stuck. A person gets disgusted with failure and leaves the problem or task for some time. Illumination stage; it is the stage of ‘Aha’! Or ‘I have found it’ experience. The moment we normally associate with emergence of creative ideas. There is felling of excitement and satisfaction, of having a creative idea. Verification stage; in this stage the worth or appropriateness of ideas or solution are tested and judged.